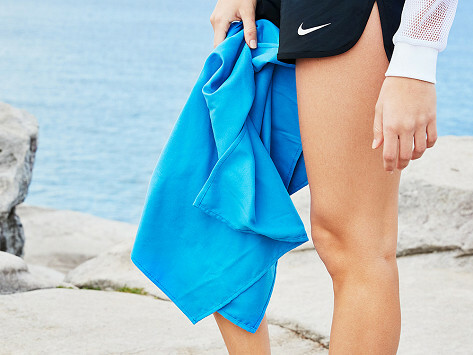 This lightweight, quick-dry towel is sized for easy on-the-go use, like on trips or at the gym. It can absorb more than its weight in water and dries three times faster than a cotton towel, thanks to a tightly woven microfiber design that feels soft like suede. The towel is also sand-resistant, making it the perfect companion on beach days. Dimensions: Towel: Small: 40" x 20"; Large: 63" x 31"; In pouch: Small: 8" x 5" x 0.01"; Large: 10" x 6" x 0.01"
Weight: Small: 0.6 lb. ; Large: 0.8 lb. Soaks up the water but much different feel than cotton. So far no complaints. Pack a sand-resistant and super-absorbent quick-dry towel from Dock & Bay for a day at the beach, a camping adventure, or a trip to the gym. Each soft towel is made with lightweight, tightly woven microfiber. This is what enables it to hold more than its weight in water, and dry three times faster than a traditional cotton towel. (It’s also what gives these towels that suede-like feel.) Because the towel dries so quickly, you can toss it right in your beach bag or backpack and not worry about musty, moldy smells settling in. Founders and best friends Ben and Andy were determined to create a better towel for their outdoor excursions. They took everything into consideration, from the generous size of the beach towel (large enough to cover a lounge chair) to the packable-sized travel towel. They both neatly stow in a handy compact carrying pouch. We think you’ll want to take a Dock & Bay towel with you wherever you go.